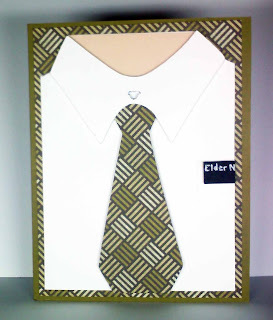 Here is a card I made for my brother, the missionary. I used the tie cut on the Father's Day page within the Designers Calendar cartridge. Then I got a scrap of skin tone paper and glued it behind the cut so it looks like he is wearing it. I also hand cut out a pocket and name tag. This would make a great card for a business man or Father's day card.